If you’re an Android user and you’re yet to try out the Amazon Appstore, now is the perfect time to sign up. Thanks to its new ‘Test Drive’ feature, you can now use over 5,000 Android applications on your handset before you commit to making a purchase. The best part is, you don’t even have to wait for them to install. While browsing the Appstore on your device, just hit the Test Drive button within the app’s description and within seconds you’ll be able to take it for a spin. Nothing is downloaded to your handset until you decide you want to make a purchase. Of course, if you’re already an Amazon Appstore user, you’ll probably be aware that the Test Drive feature has been available for some time. But until now, you had to test applications within a web browser on your computer; this is the first time you can test them directly on your Android handset — where the majority of us do our app shopping. Test Drive on Android handsets is currently still in beta, but anyone can take advantage of it simply by installing the latest version of the Amazon Appstore (2.6.53). Unfortunately, the Appstore is still only available to customers in the United States. 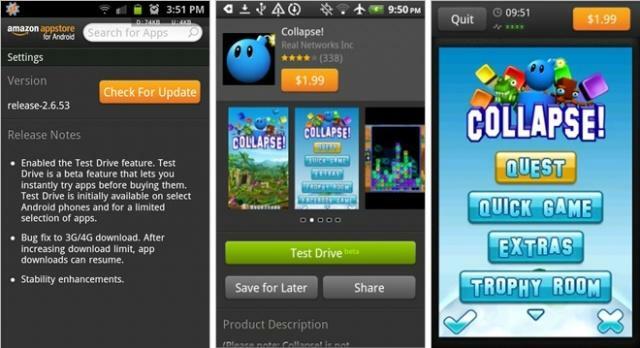 Have you tried the Appstore’s new Test Drive feature yet?